This beautiful time of year is when I want to bottle up everything fresh and hoard it for drearier times. I’ve just made concord grape jam and now I’m adding tomato jam to my little fridge stash. Tomato jam might sound a tad strange, but this isn’t a clear jelly…it’s more of a cross between tomato sauce and ketchup. I’m sure you could eat it straight up on toast although I use it like a condiment. 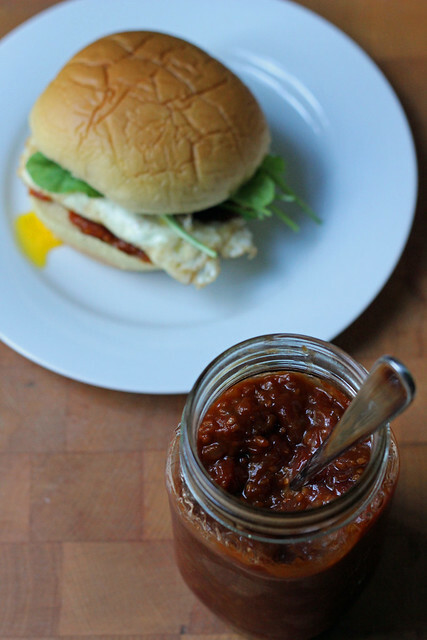 I first came across this when we lived in Sydney and I’d get the most delicious egg sandwiches with tomato jam at the Pyrmont Growers’ Market. I miss Sydney a lot…we’ve been back for several years now, but I still think about it all the time. I like that I can recreate bits and pieces of our time there, and now every September, when I have more fresh tomatoes than we can possibly eat, I made a batch of tomato jam. I’ve spiced my tomato jam up the way I like it best, with cumin and coriander, but you can adjust or change the seasonings to your own taste. It isn’t just awesome on fried egg sandwiches, but also on burgers, sausages (and sausage rolls! ), potatoes and savory pies. Steph’s Notes: This is a pretty small batch of jam– small enough that I just store it in the fridge and use it up over the course of a few weeks. I do recommend using a sterilized jar and lid though. -Begin by peeling the tomatoes: Bring a pot of water to the boil. With a sharp paring knife, score a small cross on the bottom of each tomato. Blanch the tomatoes for a minute in the boiling water or until the skin just starts peeling. Drain and then peel the skin off the tomatoes. Remove the cores and roughly chop into chunks (I think the seeds are fine). -Heat the oil in a heavy-bottomed pan (I used a 2-quart saucepan), then sauté onions with the salt for about 10 minutes or until the onions have softened and are lightly caramelized (golden but not brown). Add the garlic and spices and continue to sauté for a minute until fragrant. Add the tomato paste and cook for another minute. -Taste the jam (carefully, as obviously it will be quite hot) and add extra salt, hot pepper or vinegar if it needs an adjustment. -Store the jam in a sterilized jar and keep it in the fridge for up to a few weeks. I’d love to try this – thanks for the idea! this actually sounds really delicious! i’m one of those people who loves ketchup (on practically anything) and tomato sauce, too, so this looks perfect. beautiful pictures. Sounds delicious! I used to work in a restaurant that served tomato jam with french fries. Yum! I love tomato jam too! How fantastic with some sharp cheddar. 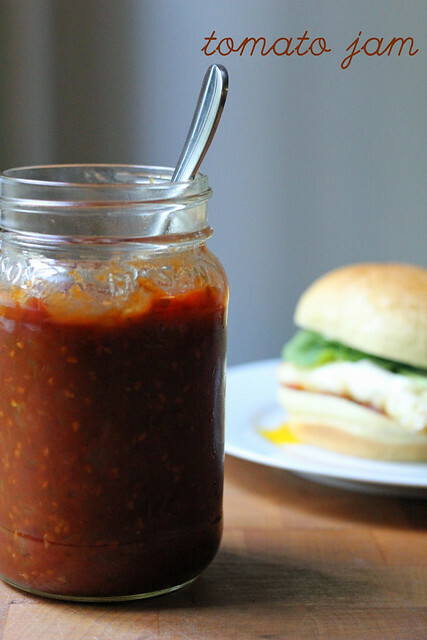 Thanks for sharing – a great twist on tomato relish and very versatile. And I hear you on the Pyrmont growers market – as a Sydneysider I feel very lucky to have such amazing local produce available year round! I’m intrigued! I’ve never tried tomato jam but it looks great! great blog, love the veggie jams – had a chilli jam last week which was so great, had it with what we call in the UK Welsh Rarebit but you guys would call a grill cheese sandwich. Nice blog too !